When Star Wars: The Force Awakens was first announced back in 2012, speculation was rampant about what previously-established characters would be included, and what new characters may be introduced. Despite the presence of the iconic characters like Han Solo (Harrison Ford), Luke Skywalker (Mark Hamill) and Leia Organa (Carrie Fisher), fans were most drawn to the new characters like Finn (John Boyega), Rey (Daisy Ridley) and Poe Dameron (Oscar Isaac). Shortly after the December 18 release, Entertainment Weekly held a Q&A session with director J.J. Abrams and writers Lawrence Kasdan and Michael Arndt. If you're one of the few who haven't seen this movie yet, there will be plenty of SPOILERS below. Shortly after Disney purchased LucasFilm, it was revealed that Michael Arndt would come aboard to write the screenplay. Eventually, Lawrence Kasdan and J.J. Abrams took over the writing duties, but Michael Arndt still received a screenplay credit, and he helped shape the earliest versions of these new characters. The writer revealed how LucasFilm president and producer Kathleen Kennedy pitched him to come aboard, revealing that she initially wanted him to write scripts for the entire new trilogy. "It was I think May 2012, and I was in New York, trying to figure out what I was going to do next. I had just finished working on The Hunger Games: Catching Fire, and I was like, 'OK, no more big Hollywood franchises.' I'm going to go back and do my own original stuff. And then Kathy called me up, and the initial thing is she wanted me to write 7, 8 and 9 together. I said there's no way I could do that, because it's just too crazy and daunting. Then, the story she pitched me was it's an origin story about a female Jedi. I said I'm in. I couldn't say no to that. I had to do it. I went to the ranch and I talked with George Lucas, and we spent a lot of time talking about samurai movies. I sort of passed that test." He went on to add that, after meeting with George Lucas, he got together with Kathleen Kennedy, Simon Kinberg and Lawrence Kasdan to discuss what the movie would be. He added that a lot of the ideas that surfaced in these early meetings were actually included in the final product. As he mentioned before, the character Rey was always set to be included, but he added how an idea from Lawrence Kasdan ultimately helped give birth to the Finn character. 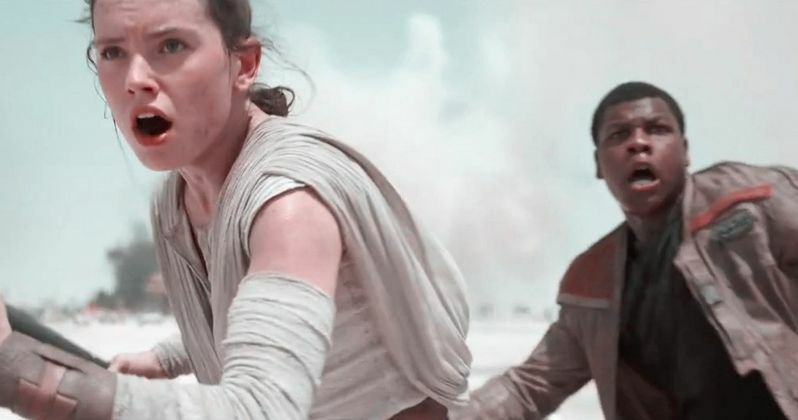 "From the very beginning we sort of settled on very quickly that we wanted the girl, Rey, to be a scavenger. We always wanted her to be the ultimate outsider and the ultimate disenfranchised person, because that person has the longest journey. And then we were struggling to figure out who the male lead was going to be. I remember we talked about pirates and merchant marines and all this stuff, and finally Larry [Kasdan] got pissed at all of us and he's just like, 'You guys, you're not thinking big. What if he's a stormtrooper that ran away?' And we were all like, 'Oh my god!'" Of course, Rey and Finn will be returning in Star Wars: Episode VIII, which starts production next month, under the direction of Rian Johnson. Hopefully we'll learn more about Rey and Finn's journey as we get closer and closer to Star Wars 8. You can visit Entertainment Weekly to listen to the entire one-hour Q&A session, and stay tuned for more on the Star Wars universe.